HTML 5.2 Recommendation: "The XHTML Syntax"
HTML 5 (formerly and commonly spelled HTML5[a]) is a software solution stack that defines the properties and behaviors of web page content by implementing a markup based pattern to it. HTML 5 is the fifth and current major version of the HTML standard, and subsumes XHTML. It currently exists in two standardized forms: HTML 5.2 Recommendation by the World Wide Web Consortium (W3C, a broad coalition of organizations), intended primarily for Web content developers; and HTML Living Standard by WHATWG (a small consortium of four browser vendors), intended primarily for browser developers, though it also exists in an abridged Web developer version. There are minor conflicts between the two groups' specifications. HTML 5 was first released in public-facing form on 22 January 2008, with a major update and "W3C Recommendation" status in October 2014. Its goals are to improve the language with support for the latest multimedia and other new features; to keep the language both easily readable by humans and consistently understood by computers and devices such as Web browsers, parsers, etc., without XHTML's rigidity; and to remain backward-compatible with older software. HTML 5 is intended to subsume not only HTML 4, but also XHTML 1 and DOM Level 2 HTML; the HTML 4 and XHTML specs were announced as superseded by HTML 5.2 on 27 March 2018. HTML 5 includes detailed processing models to encourage more interoperable implementations; it extends, improves and rationalizes the markup available for documents, and introduces markup and application programming interfaces (APIs) for complex web applications. For the same reasons, HTML 5 is also a candidate for cross-platform mobile applications, because it includes features designed with low-powered devices in mind. Many new syntactic features are included. To natively include and handle multimedia and graphical content, the new <video>, <audio> and <canvas> elements were added, and support for scalable vector graphics (SVG) content and MathML for mathematical formulas. To enrich the semantic content of documents, new page structure elements such as <main>, <section>, <article>, <header>, <footer>, <aside>, <nav>, and <figure> are added. New attributes are introduced, some elements and attributes have been removed, and others such as <a />, <cite>, and <menu> have been changed, redefined, or standardized. The APIs and Document Object Model (DOM) are now fundamental parts of the HTML 5 specification and HTML 5 also better defines the processing for any invalid documents. The Web Hypertext Application Technology Working Group (WHATWG) began work on the new standard in 2004. At that time, HTML 4.01 had not been updated since 2000, and the World Wide Web Consortium (W3C) was focusing future developments on XHTML 2.0. In 2009, the W3C allowed the XHTML 2.0 Working Group's charter to expire and decided not to renew it. The Mozilla Foundation and Opera Software presented a position paper at a World Wide Web Consortium (W3C) workshop in June 2004, focusing on developing technologies that are backward-compatible with existing browsers, including an initial draft specification of Web Forms 2.0. The workshop concluded with a vote—8 for, 14 against—for continuing work on HTML. Immediately after the workshop, WHATWG was formed to start work based upon that position paper, and a second draft, Web Applications 1.0, was also announced. The two specifications were later merged to form HTML 5. The HTML 5 specification was adopted as the starting point of the work of the new HTML working group of the W3C in 2007. WHATWG's Ian Hickson (Google) and David Hyatt (Apple) produced W3C's first public working draft of the specification on 22 January 2008. On 14 February 2011, the W3C extended the charter of its HTML Working Group with clear milestones for HTML 5. In May 2011, the working group advanced HTML 5 to "Last Call", an invitation to communities inside and outside W3C to confirm the technical soundness of the specification. The W3C developed a comprehensive test suite to achieve broad interoperability for the full specification by 2014, which was the target date for recommendation. In January 2011, the WHATWG renamed its "HTML5" specification HTML Living Standard. 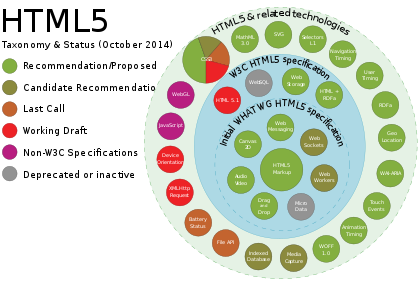 The W3C nevertheless continued its project to release HTML 5. In July 2012, WHATWG and W3C decided on a degree of separation. W3C will continue the HTML 5 specification work, focusing on a single definitive standard, which is considered as a "snapshot" by WHATWG. The WHATWG organization continues its work with HTML 5 as a "living standard". The concept of a living standard is that it is never complete and is always being updated and improved. New features can be added but functionality will not be removed. In December 2012, W3C designated HTML 5 as a Candidate Recommendation. The criterion for advancement to W3C Recommendation is "two 100% complete and fully interoperable implementations". On 16 September 2014, W3C moved HTML 5 to Proposed Recommendation. On 28 October 2014, HTML 5 was released as a W3C Recommendation, bringing the specification process to completion. On 1 November 2016, HTML 5.1 was released as a W3C Recommendation. On 14 December 2017, HTML 5.2 was released as a W3C Recommendation. W3C and WHATWG have been characterized as both working together on the development of HTML 5, and yet also at cross purposes ever since the July 2012 split of the W3C work into milestone-based static standards and WHATWG's into a continually updated "living standard". The relationship has been described as "fragile", even a "rift", and characterized by "squabbling". In at least one case, namely the permissible content of the <cite> element, the two specifications directly contradict each other (as of July 2018),[update] with the W3C definition being permissive and reflecting traditional use of the element since its introduction, but WHATWG limiting it to a single defined type of content (the title of the work cited). This is actually at odds with WHATWG's stated goals of ensuring backward compatibility and not losing prior functionality. The "markets" for the two specifications are largely different. The W3C spec is the one that Web developers most often refer to, while the WHATWG version is used by the software development teams of the browser makers (though a version exists for Web content authors, trimmed of the material only of interest to browser coders). New features are added to HTML and, often experimentally, to browsers long before they appear in a W3C spec, because they arise in the WHATWG one. The technology journal Ars Technica observed that "both groups are likely to continue to exist, and both groups will continue to have broad-based industry backing". <address> is in section Grouping content. <address> is in section Sections. § <meta> §4.2.5.4. Other pragma directives, based on deprecated WHATWG procedure. Structured data Recommends RDFa (code examples, separate specs, no special attributes). Recommends Microdata (code examples, spec chapter, special attributes). <hgroup> WHATWG All browsers "[Since] the HTML outline algorithm is not implemented in any browsers ... the <hgroup> semantics are in practice only theoretical." <menu> WHATWG Full support only in Edge and Firefox desktop. Partial support in Firefox mobile. Supported in Opera with user opt-in. Not supported in other browsers. Web Apps Working Group – Web Messaging, Web workers, Web storage, WebSocket, Server-sent events, Web Components (this was not part of HTML 5, though); the Web Applications Working Group was closed in October 2015 and its deliverables transferred to the Web Platform Working Group (WPWG). Web Media Text Tracks Community Group – WebVTT. After the standardization of the HTML 5 specification in October 2014, the core vocabulary and features are being extended in four ways. Likewise, some features that were removed from the original HTML 5 specification have been standardized separately as modules, such as Microdata and Canvas. Technical specifications introduced as HTML 5 extensions such as Polyglot Markup have also been standardized as modules. Some W3C specifications that were originally separate specifications have been adapted as HTML 5 extensions or features, such as SVG. Some features that might have slowed down the standardization of HTML 5 will be standardized as upcoming specifications, instead. HTML 5.1 is expected to be finalized in 2016, and it is currently on the standardization track at the W3C. HTML 5 introduces elements and attributes that reflect typical usage on modern websites. Some of them are semantic replacements for common uses of generic block (<div>) and inline (<span>) elements, for example <nav> (website navigation block), <footer> (usually referring to bottom of web page or to last lines of HTML code), or <audio> and <video> instead of <object>. Some deprecated elements from HTML 4.01 have been dropped, including purely presentational elements such as <font> and <center>, whose effects have long been superseded by the more capable Cascading Style Sheets. There is also a renewed emphasis on the importance of DOM scripting in Web behavior. The HTML 5 syntax is no longer based on SGML despite the similarity of its markup. It has, however, been designed to be backward-compatible with common parsing of older versions of HTML. It comes with a new introductory line that looks like an SGML document type declaration, <!DOCTYPE html>, which triggers the standards-compliant rendering mode. Since 5 January 2009, HTML 5 also includes Web Forms 2.0, a previously separate WHATWG specification. Web Storage – a key-value pair storage framework that provides behaviour similar to cookies but with larger storage capacity and improved API. HTML 5 is designed so that old browsers can safely ignore new HTML 5 constructs. In contrast to HTML 4.01, the HTML 5 specification gives detailed rules for lexing and parsing, with the intent that compliant browsers will produce the same results when parsing incorrect syntax. Although HTML 5 now defines a consistent behavior for "tag soup" documents, those documents are not regarded as conforming to the HTML 5 standard. According to a report released on 30 September 2011, 34 of the world's top 100 Web sites were using HTML 5 – the adoption led by search engines and social networks. Another report released in August 2013 has shown that 153 of the Fortune 500 U.S. companies implemented HTML5 on their corporate websites. Since 2014, HTML 5 is at least partially supported by most popular layout engines. W3C Working Group publishes "HTML5 differences from HTML 4", which provides a complete outline of additions, removals and changes between HTML 5 and HTML 4. On 18 January 2011, the W3C introduced a logo to represent the use of or interest in HTML 5. Unlike other badges previously issued by the W3C, it does not imply validity or conformance to a certain standard. As of 1 April 2011, this logo is official. When initially presenting it to the public, the W3C announced the HTML 5 logo as a "general-purpose visual identity for a broad set of open web technologies, including HTML 5, CSS, SVG, WOFF, and others". Some web standard advocates, including The Web Standards Project, criticized that definition of "HTML5" as an umbrella term, pointing out the blurring of terminology and the potential for miscommunication. Three days later, the W3C responded to community feedback and changed the logo's definition, dropping the enumeration of related technologies. The W3C then said the logo "represents HTML5, the cornerstone for modern Web applications". Industry players including the BBC, Google, Microsoft, Apple Inc. have been lobbying for the inclusion of Encrypted Media Extensions (EME), a form of digital rights management (DRM), into the HTML 5 standard. As of the end of 2012 and the beginning of 2013, 27 organisations including the Free Software Foundation have started a campaign against including digital rights management in the HTML 5 standard. However, in late September 2013, the W3C HTML Working Group decided that Encrypted Media Extensions, a form of DRM, was "in scope" and will potentially be included in the HTML 5.1 standard. WHATWG's "HTML Living Standard" continued to be developed without DRM-enabled proposals. Manu Sporny, a member of the W3C, said that EME will not solve the problem it's supposed to address. Opponents point out that EME itself is just an architecture for a DRM plug-in mechanism. The initial enablers for DRM in HTML 5 were Google and Microsoft. Supporters also include Adobe. On 14 May 2014, Mozilla announced plans to support EME in Firefox, the last major browser to avoid DRM. Calling it "a difficult and uncomfortable step", Andreas Gal of Mozilla explained that future versions of Firefox would remain open source but ship with a sandbox designed to run a content decryption module developed by Adobe. While promising to "work on alternative solutions", Mozilla's Executive Chair Mitchell Baker stated that a refusal to implement EME would have accomplished little more than convincing many users to switch browsers. This decision was condemned by Cory Doctorow and the Free Software Foundation. ^ In early W3C recommendations, there was no space between "HTML" and "5" in the name. This has not been the case since HTML 5.1; the current specification is named HTML 5.2 W3C Recommendation, and "HTML5" does not appear in it. WHATWG had also used the "HTML5" spelling, but their specification is now named HTML Living Standard, and they have abandoned version numbering. ^ "Mac Developer Library: System-Declared Uniform Type Identifiers". Apple. 17 November 2009. ^ a b c d e f "HTML5 specification finalized, squabbling over specs continues". Ars Technica. 29 October 2014. Retrieved 29 October 2014. ^ "A vocabulary and associated APIs for HTML and XHTML". W3.org. World Wide Web Consortium (W3C). 28 October 2014. Retrieved 26 July 2018. ^ a b Faulkner, Steve; Eicholz, Arron; Leithead, Travis; Danilo, Alex; Moon, Sangwhan; Doyle Navara, Erika; O'Connor, Theresa; Berjon, Robin, eds. (14 December 2017) . "HTML 5.2 W3C Recommendation". Revised version. World Wide Web Consortium (W3C). Retrieved 26 July 2018. ^ a b Hickson, Ian, ed. (25 July 2018). "HTML Living Standard". Multipage Version. WHATWG. Retrieved 26 July 2018. ^ a b Hickson, Ian, ed. (25 July 2018). "HTML Living Standard". Developer's Edition. WHATWG. Retrieved 26 July 2018. ^ a b "HTML5: A vocabulary and associated APIs for HTML and XHTML". W3.org. W3C. 22 January 2008. Retrieved 28 January 2009. ^ "HTML5 is a W3C recommendation". W3C Blog. World Wide Web Consortium (W3C). 28 October 2014. Retrieved 28 October 2014. ^ a b c "HTML5 Differences from HTML4". W3.org. W3C. 19 October 2010. Retrieved 4 December 2010. ^ "HTML 5.2 W3C Recommendation". W3.org. W3C. 14 December 2017. § 1.10.2 Syntax Errors. Retrieved 29 June 2017. ^ "HTML 4 Errata". World Wide Web Consortium. Retrieved 4 December 2010. ^ a b "HTML 5.2 W3C Recommendation". W3.org. W3C. 14 December 2017. § 1.4 History. Retrieved 9 August 2017. ^ "Position Paper for the W3C Workshop on Web Applications and Compound Documents". W3.org. W3C. Retrieved 30 December 2011. ^ "W3C Workshop on Web Applications and Compound Documents (Day 1)". W3.org. W3C. 1 June 2004. Retrieved 30 December 2011. ^ "W3C Workshop on Web Applications and Compound Documents (Day 2)". W3.org. W3C. 2 June 2004. Retrieved 30 December 2011. ^ Hickson, -Ian (5 June 2004). "&#91whatwg] WHAT open mailing list announcement". Lists.W3.org. W3C. Retrieved 8 December 2015. ^ Pilgrim, Mark (15 September 2008). "This Week in HTML 5 – Episode 5". WHATWG Blog. WHATWG. Retrieved 30 December 2011. ^ "FOX News: No Flash on the iPhone? Apple's Steve Jobs Finally Explains Why". Fox News. 29 April 2010. ^ "TIME: Steve Jobs: 'Flash is No Longer Necessary' and Other Musings". Time. 29 April 2010. ^ "Steve Jobs: Why Apple Banned Flash". CBS News. ^ "FastCompany: Steve Jobs: Adobe's Flash Is Old PC History, Open Web Is the Future". ^ "'Thoughts on Flash', by Steve Jobs, CEO of Apple, Inc". Apple.com. Retrieved 8 January 2014. ^ "Is HTML5 Replacing Flash?". Lyquix.com. Retrieved 8 January 2014. ^ "Flash to Focus on PC Browsing and Mobile Apps; Adobe to More Aggressively Contribute to HTML5". adobe.com. Retrieved 26 February 2012. ^ Warren, Tom (25 July 2017). "Adobe will finally kill Flash in 2020". The Verge. Vox Media. ^ a b c "HTML5 gets the splits". NetMagazine.com. Retrieved 23 July 2012. ^ "HTML5". W3.org. 17 December 2012. Retrieved 15 June 2013. ^ "Call for Review: HTML5 Proposed Recommendation Published W3C News". W3.org. W3C. 16 September 2014. Retrieved 27 September 2014. ^ "Open Web Platform Milestone Achieved with HTML5 Recommendation". W3.org. W3C. 28 October 2014. Retrieved 29 October 2014. ^ "HTML 5.1 W3C Recommendation". W3.org. W3C. Retrieved 26 February 2017. ^ "HTML 5.2 W3C Recommendation". W3.org. W3C. Retrieved 14 December 2017. ^ "Web Applications 1.0". 3 May 2007. Retrieved 18 September 2018. ^ "Plan 2014". World Wide Web Consortium. Retrieved 23 September 2012. ^ "Editor's Draft". World Wide Web Consortium. Retrieved 6 September 2017. ^ "HTML 5.2 W3C Recommendation". W3.org. W3C. 14 December 2017. § 4.5.6. The cite element. Retrieved 26 July 2018. ^ "HTML Living Standard". HTML.spec.WHATWG.org. WHATWG. 25 July 2018. § 4.5.6 The cite element. Retrieved 26 July 2018. ^ "HTML Living Standard". HTML.spec.WHATWG.org. WHATWG. 25 July 2018. § 1.6 History. Retrieved 26 July 2018. ^ "HTML Living Standard". HTML.spec.WHATWG.org. WHATWG. 25 July 2018. § 1 Introduction; §1.6 History. Retrieved 26 July 2018. ^ "HTML 5.2". www.w3.org. Retrieved 18 September 2018. ^ "HTML Standard". html.spec.whatwg.org. Retrieved 18 September 2018. ^ "HTML Standard, One-Page Version". html.spec.whatwg.org. Retrieved 18 September 2018. ^ a b "HTML Standard, Chapter 5: Microdata". html.spec.whatwg.org. Retrieved 19 September 2018. ^ "HTML Standard, Chapter 9: Communication". html.spec.whatwg.org. Retrieved 19 September 2018. ^ "HTML Standard, Chapter 10: Web workers". html.spec.whatwg.org. Retrieved 19 September 2018. ^ "HTML Standard, Chapter 11: Web storage". html.spec.whatwg.org. Retrieved 19 September 2018. ^ a b "HTML 5.2, § 3.2.5. Global attributes". www.w3.org. Retrieved 18 September 2018. ^ a b "HTML Standard, § 3.2.6 Global attributes". html.spec.whatwg.org. Retrieved 18 September 2018. ^ "HTML Standard, § 4.13 Custom elements". html.spec.whatwg.org. Retrieved 18 September 2018. ^ "HTML 5.2: § 4.5.11. The rb element". www.w3.org. Retrieved 19 September 2018. ^ "HTML 5.2: § 4.5.13. The rtc element". www.w3.org. Retrieved 19 September 2018. ^ a b "HTML 5.2: § 4.4.2. The address element". www.w3.org. Retrieved 19 September 2018. ^ "HTML Standard, § 4.3.7 The hgroup element". html.spec.whatwg.org. Retrieved 19 September 2018. ^ "HTML Standard, § 4.4.7 The menu element". html.spec.whatwg.org. Retrieved 19 September 2018. ^ "HTML Standard, § 4.12.4 The slot element". html.spec.whatwg.org. Retrieved 19 September 2018. ^ "HTML Standard, § 4.3.10 The address element". html.spec.whatwg.org. Retrieved 19 September 2018. ^ "HTML 5.2: § 4.2.5.4. Other pragma directives". www.w3.org. Retrieved 19 September 2018. ^ "PragmaExtensions - WHATWG Wiki". wiki.whatwg.org. Retrieved 19 September 2018. This document is obsolete. ^ "HTML Standard, § 4.3.11.2 Sample outlines". html.spec.whatwg.org. Retrieved 19 September 2018. ^ "HTML Standard, § 4.3.11.3 Exposing outlines to users". html.spec.whatwg.org. Retrieved 19 September 2018. ^ "HTML 5.2: § 4.3.2. The article element". www.w3.org. Retrieved 18 September 2018. ^ "HTML 5.2: § 4.5.16. The time element". www.w3.org. Retrieved 18 September 2018. ^ "HTML+RDFa 1.1 - Second Edition". www.w3.org. Retrieved 18 September 2018. ^ "RDFa Lite 1.1 - Second Edition". www.w3.org. Retrieved 18 September 2018. ^ "HTML Standard, § 4.3.2 The article element". html.spec.whatwg.org. Retrieved 18 September 2018. ^ "HTML Standard, § 4.3.4 The nav element". html.spec.whatwg.org. Retrieved 18 September 2018. ^ "HTML Standard, § 4.4.9 The dl element". html.spec.whatwg.org. Retrieved 18 September 2018. ^ "HTML Standard, § 4.5.14 The time element". html.spec.whatwg.org. Retrieved 18 September 2018. ^ "<rb>: The Ruby Base element". MDN Web Docs. Retrieved 19 September 2018. ^ "<rtc>: The Ruby Text Container element". MDN Web Docs. Retrieved 19 September 2018. ^ "<hgroup>". MDN Web Docs. Retrieved 19 September 2018. ^ "<menu>". MDN Web Docs. Retrieved 19 September 2018. ^ "<slot>". MDN Web Docs. Retrieved 19 September 2018. ^ "PubStatus – WEBAPPS". W3.org. W3C. ^ "HTML5: A Vocabulary and Associated APIs for HTML and XHTML". Retrieved 10 March 2015. ^ Leslie Sikos. "HTML5 Became a Standard, HTML 5.1 and HTML 5.2 on the Way". Retrieved 10 March 2015. ^ "11 Obsolete features — HTML5". W3C. Retrieved 11 March 2014. ^ HTML5 DTD: "HTML5 is not SGML-based, and there will be no official DTD for it." ^ HTML 5 Reference: "Although it is inspired by its SGML origins, in practice, it really only shares minor syntactic similarities. ... As HTML5 is no longer formally based upon SGML, the DOCTYPE no longer serves this purpose, and thus no longer needs to refer to a DTD." ^ Shannon Suetos (26 April 2010). "HTML5: Worth the Hype?". instantshift.com. Retrieved 21 October 2012. ^ a b van Kesteren, Anne; Pieters, Simon. "HTML5 differences from HTML4". World Wide Web Consortium. Retrieved 29 June 2017. ^ "Get Started with HTM Canvas". www.syntaxxx.com. ^ "Offline Web Applications". World Wide Web Consortium. ^ "The History interface". w3.org. ^ "Web Messaging specification". whatwg.org. ^ "Web Storage specification". whatwg.org. ^ href. "1 Introduction — HTML Standard". Whatwg.org. Retrieved 8 January 2014. ^ "Indexed Database". World Wide Web Consortium. ^ "File API". W3.org. Retrieved 8 January 2014. ^ "File API". World Wide Web Consortium. ^ "Filesystem API". World Wide Web Consortium. ^ "File API: Writer". World Wide Web Consortium. ^ "Web Audio API". World Wide Web Consortium. Retrieved 2 March 2018. ^ "Web Cryptography API". www.w3.org. ^ "WebRTC 1.0: Real-time Communication Between Browsers". www.w3.org. ^ "Web SQL Database". World Wide Web Consortium. ^ Williamson, James (2010). "What HTML5 is (and what it isn't)". Retrieved 14 May 2014. ^ Graff, Eliot. "Polyglot Markup: HTML-Compatible XHTML Documents". W3C. Retrieved 6 July 2013. ^ a b "FAQ – WHATWG Wiki". WHATWG. Retrieved 26 August 2011. ^ "Percentage of Web sites Using HTML5". binvisions. Retrieved 21 October 2011. ^ "HTML5 Popularity Among Fortune 500 Companies". INCORE. Retrieved 5 March 2013. ^ "HTML5 form additions". World Wide Web Consortium. Retrieved 13 October 2014. ^ "HTML5 Differences from HTML4". FAQ. World Wide Web Consortium. 9 December 2014. Retrieved 2 March 2018. ^ a b "W3C HTML5 Logo FAQ". World Wide Web Consortium. Retrieved 21 January 2011. Is this W3C's "official" logo for HTML5? Yes, as of 1 April 2011. ^ a b "HTML5 Logo: Be Proud, But Don't Muddy the Waters!". The Web Standards Project. Retrieved 22 January 2011. ^ "The HTML5 Logo Conversation". World Wide Web Consortium. Retrieved 21 January 2011. ^ Peter Bright (16 April 2013). "Netflix coming to HTML5 just as soon as the DRM ducks are in a row". Ars Technica. ^ Manu Sporny (26 January 2013). "DRM in HTML5". ^ "Tell W3C: We don't want the Hollyweb". Free Software Foundation. May 2013. ^ "HTML5 webpage locks 'would stifle innovation'". BBC News Online. 30 May 2013. ^ "Une coalition de vingt-sept organisations demande au W3C de garder les menottes numériques (DRM) hors des standards du Web". 24 April 2013. Retrieved 14 May 2014. ^ "Tell W3C: We don't want the Hollyweb - Free Software Foundation". www.defectivebydesign.org. ^ Stallman, Richard (2 May 2013). "The W3C's Soul at Stake". The Free Software Foundation. Retrieved 14 May 2014. ^ Lord, Timothy (16 April 2013). "Netflix Wants to Go HTML5, but Not Without DRM". Retrieved 14 May 2014. ^ "New Charter for the HTML Working Group from Philippe Le Hegaret on 2013-09-30 (public-html-admin@w3.org from September 2013)". Lists.w3.org. 30 September 2013. Retrieved 8 January 2014. ^ a b Danny O'Brien (2 October 2013). "Lowering Your Standards: DRM and the Future of the W3C". Electronic Frontier Foundation. Retrieved 3 October 2013. ^ Manu Sporny (26 January 2013). "DRM in HTML5". The Beautiful, Tormented Machine. Manu Sporny. Archived from the original on 25 April 2014. Retrieved 16 May 2014. ^ "Releasenotes for Google Chrome 25.0.1364.87". ^ "HTML5 Video in IE 11 on Windows 8.1". ^ Adobe Support for Encrypted Media Extensions Adobe.com. 19 June 2013. ^ a b Gal, Andreas (14 May 2014). "Reconciling Mozilla's Mission and W3C EME". Mozilla. Retrieved 20 May 2014. ^ a b Baker, Mitchell (14 May 2014). "DRM and the Challenge of Serving Users". Mozilla. Retrieved 20 May 2014. ^ Doctorow, Cory (14 May 2014). "Firefox's adoption of closed-source DRM breaks my heart". The Guardian. Retrieved 20 May 2014. ^ "FSF condemns partnership between Mozilla and Adobe to support Digital Rights Management". Free Software Foundation. 14 May 2014. Retrieved 20 May 2014. This page was last edited on 12 March 2019, at 18:57 (UTC).